Many today find themselves being called toward greater leadership on behalf of the Earth, toward leadership sourced from their inner authority and inspired by what they love and are dedicated to protect, transform, and strengthen. Those successfully heeding this call have embraced the qualities previously relegated to the “feminine”--inner awareness, collaboration, relational intelligence, respect for the sacred and generosity--and married them to the best of their “masculine” attributes to create a new form of leadership more inspiring, inviting, and effective for transforming how we live on Earth and with each other. This anthology presents more than 30 essays from eminent women trailblazers--such as author Alice Walker, psychiatrist Jean Shinoda Bolen, playwright Eve Ensler, holistic doctor Rachel Naomi Remen, biologist Janine Benyus, hip-hop performer Rha Goddess, and famous tree-sitter Julia Butterfly Hill--as well as lesser-known but equally influential leaders--such as social entrepreneur Judy Wicks, philanthropic activist Kathy LeMay, food justice advocate LaDonna Redmond, and media educator Sofia Quintero. Their narratives explore how they cultivated their leadership impulses and their “feminine” strengths, reinventing leadership to prioritize community, collaboration, the environment, and the common good. Illuminating a path to progressive environmental and social change, their passionate stories of joyful, creative, collaborative, and sacred leadership ignite within each reader the power to help cocreate a healthy, peaceful, just, and sustainable world. I am the artistic director of a nonprofit arts education and violence prevention organization called Destiny Arts Center, based in Oakland, California. Our mission is to end isolation, prejudice, and violence in the lives of young people. Every single day we just show up with our hearts as open as possible. We teach violence prevention by serving youth ages three to eighteen in after-school, weekend, and summer programs featuring dance, martial arts, theater, self-defense, conflict resolution, and leadership. We’re located in a small community center in the middle of a residential neighborhood. Here we intentionally limit the number of youth to 150, so that we can remain true to our commitment to serve them at a deep level in a place that feels like home. In order to serve larger numbers we send our instructors out into twenty-five public preschool, elementary, middle, and high schools each year. And our performance groups perform for up to 25,000 audience members annually. It takes a whole lot of time, a whole lot of love, a whole lot of spirit and patience for young people to recognize that they have the power to make change. We, as their role models, have the responsibility to show them that we understand our own power to make change so that they see it’s possible. I have to tell you a story. I did a theater exercise where I asked a group of young people to get into a circle. It’s called the emotion game in which we play with or create emotions in increasing intensity, from one to ten, ten being huge. So the first emotion I gave them was fear. I said let’s experience fear. I said, picture something that you’re really afraid of in the middle of the circle. I counted from one to ten and by the time I got to ten they were trembling and contorting their bodies in terror. It was palpable. Then we did anger. Again, their bodies were really into it. One, two, three . . . I slowly counted all the way to ten and their faces and bodies were gripped and clenched in anger. Then I said, okay, let’s try bliss. Who knows what that is? Somebody defined it as extreme happiness. I said, that’s good enough. I started the counting, one, two, three--and nothing happened. They just stood there giggling, and telling me it was stupid. They couldn’t do it. I said: Okay, wait. You mean to tell me that you can feel and express fear and anger but not bliss? What are we here for then? Do you want to change the world? Start right here. Experience bliss. I dare you. I admit it, this was a dare to myself. I was praying at the same time. Lord, they already think I’m crazy. And now I’m taking them to bliss? Then I prayed, and I centered myself. I recognized that I had recently been in this space of noticing how terrifying it is to want something and then ask and expect to get it. It’s subtle, this releasing the fear of scarcity, which is a story so safe it’s habitual. My task is to allow the fear to exist but to step past it, and choose something different from fear in each interaction. I want my students to be removed from the terror of wanting something different, to know that they belong on the planet, that they belong in their bodies, that they’re here as precious beings for a purpose, to connect with other beings and to remove the illusion of separation between us all. I want them to know that it requires incredible discipline and perseverance and imagination to create change. So here I was in a circle of teenagers daring them to experience, just for a few moments, something other than the fear, anger, and disempowerment they feel over and over again in their lives. I was asking them to be bold, to be true revolutionaries. I said to them: Let us be willing to be in bliss, because if we can’t do that, what are we creating? What are we dreaming up for this world? It takes courage to be in this place of joy and bliss together--maybe more than fear or anger. I could feel the group resonate with what I was saying. We all held hands and we looked at each other, and I asked: Are you with me? Can you make the commitment to be in bliss with me right now? Everybody was nodding. Their expressions were determined. So I counted, one, two, three, four . . . Their bodies softened. Their expressions sweetened. Their defenses dropped. By the time I got to ten, every single kid in that circle was weeping with pure joy and amazement. They were weeping because they saw each other’s beauty and felt their own. Afterward, we sat and we debriefed. One girl, choking through her tears, asked: If we could just see each other from this place all the time, who would we be, what would this world be like? What happens when we create this space for young people? What happens when we witness and testify to their fear, anger, and hopelessness and then model for them complete recognition that we can also choose bliss, that we have the ability to see beauty in one another? Giving them that opportunity lights up their hidden spaces and lets them make bold strokes on life’s paper. Sarah Crowell is the artistic director at Destiny Arts Center (www.destinyarts.org), an arts education/violence prevention center for youth based in Oakland, California. Sarah is the recipient of the 2007 KPFA peace award and the 2006 Purple Moon DreamSpeakers award. She has performed both nationally and internationally with modern, jazz, and dance/theater companies in Boston and the Bay Area since 1984. "Reading Moonrise--or even scanning the names of contributors and titles--will make the reader very aware that there are many important conversations, thoughts, and feelings articulated here. It is affirming to find in the words of others, our own heart-felt knowledge expressed, or echoed. Within these pages, there is feminine wisdom and collaborative ways of solving problems that the planet sorely needs now." "How could the title of this book not hook you? Power. Women. Heart. So, maybe I was biased from the beginning. Honestly, I was hoping that the book would be "all that." It was. By page fifteen, not having gotten past the editor's introduction, I was pulsing with energy. . . Each and every essay contained in Moonrise is inspiring, touching, and revitalizing to the reader. Not all of the authors are women, but each and every one of them celebrates the unique gifts that women bring to the world in the form of their vision and perspective as caring, compassionate individuals, who have found ways to rise above feelings of powerlessness and living in the minority to honor their communities, societies, and indeed, the entire planet." 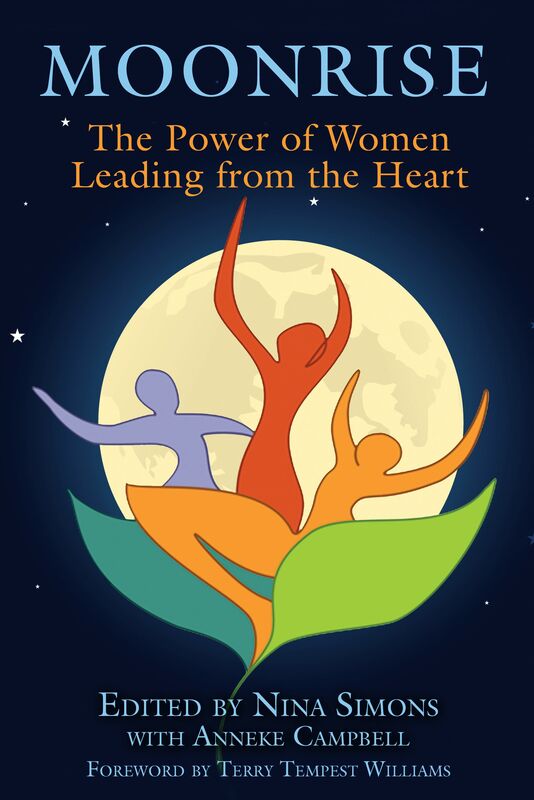 "The stories from these activists, biologists, doctors, writers and others offer glimpses into their leadership impulses, and how they perceive and use their feminine strengths, and ways they are reinventing a more yin-based leadership model. Many of them have mentored dozens of younger women, so there are sure to be valuable mentoring gems in their stories." "Like an inspirational daybook and resource for social and environmental change visionaries, Moonrise shines beams of hope on efforts to bring inner feminine qualities into conscious leadership--and illuminates what the result can look like. . . . After reading thirty-seven rich, true perspectives, some may find the heartbreak and loss of our mistakes too much to bear. Yet, as women recognize, tears can soften unyielding ground. This compendium for change agents is highly recommended." "Moonrise should be required reading to anyone, particularly women, who are looking for inspiring ideas, unique perspectives, and calls to action with regards to the social and environmental challenges that we're all facing." "All thirty essays convey healing to the separation of masculine and feminine by bringing the two together as one and forging forward in harmony. Each Story has a powerful message; a message of hope."